Of the many Palais in Vienna, some are prettier than average, others uglier - to decide in which of these disciplines the Palais Coburg stands out, is up to you. That it does stand out from the crowd of Palais is certain - be it for its location high up on a former bastion or for its unusual architecture. A few words on the history of Palais Coburg: It was built for Duke Ferdinand Georg August von Sachsen-Coburg, a statesman, nobleman and cavalry general of the Austrian Empire, between 1840 and 1845. This is much later than most other Palais in the first district, where palaces usually date back at least to the 18th century. The architects in charge were first Karl Schleps and then after Schleps′ death Adolph Korompay. They designed a bizarrely playful, white palace with lots and lots of pillars and on top of the artificial "cliff" of a city wall bastion. In terms of its style, Palais Coburg is seen to mark the transition from late Classicism to early Historicism. As soon as the building was finished, the Viennese nicknamed it "Spargelburg" - "Asparagus Castle", due to the excessive use of thin, white pillars as decorative elements. Palais Coburg overlooks a part of the Ringstraße and the trees of the Stadtpark; the city of Vienna granted to the Sachsen-Coburg family that the piece of land would not be used for any housing developments and therefore, it has to remain an open square. 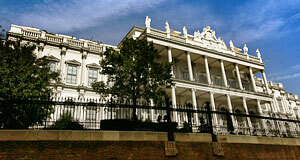 Palais Coburg remained the property of the Sachsen-Coburg family until 1978, when it was sold to a real estate agent. This was no fundamental turning point - Palais Coburg had served as an apartment house, shelter for Soviet soldiers, and as the headquarter for the Austrian National Railways in the decades before. Despite of the sale, Princess Aurelia of Sachsen-Coburg-Kohary continued to live in the palace with her family until 1994. By this time, Palais Coburg was already in urgent need for a thorough renovation. In 2000, the renovation started and soon, the Palace was once again as shiny as in 1845. Since the renovation is complete, Palais Coburg houses a luxurious suite-only hotel: 35 suites, all named after a famous member of the Sachsen-Coburg and Gotha family. The wedding-cake like Palais Coburg was designed to impress in a style that seems to appeal to new money - the hotel is popular with Russian "businessmen", a certain type of Austrian politicians and "event" managers. At the ground floor, you will find a restaurant and concerts are held in the Palais regularly. Attractions nearby are numerous: Try the Stadtpark, the Haus der Musik, the Ronacher, the Museum for Applied Art, the Jesuitenkirche and Alte Aula, Franziskanerkirche or the Dominikanerkirche; or the Staatsoper National Opera. If you are willing to go for a bit of a walk, all attractions of the first district, most of the third and a fair chunk of the fourth district are in walking distance to Palais Coburg; and the Ringstraße with its many public means of transport is the ideal hub for getting around.